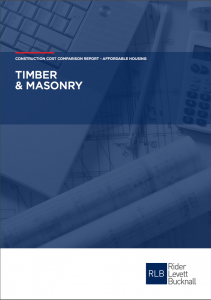 Leading independent construction, property and management consultant, Rider Levett Bucknall UK (RLB UK), has launched the industry’s first construction cost comparison report between timber frame and masonry in affordable housing. Author of the report, RLB Partner, Ian Dacre – a specialist in the residential sector who has delivered over 1,100 homes, said: “We were very pleased to be able to carry out this independent study. With the recent government announcement of the presumption in favour of offsite manufacture for all publicly funded projects from 2019, and the current drive for increased housing development, we wanted to evaluate what is the most economical build solution for affordable housing. • The timber build programme is shorter.